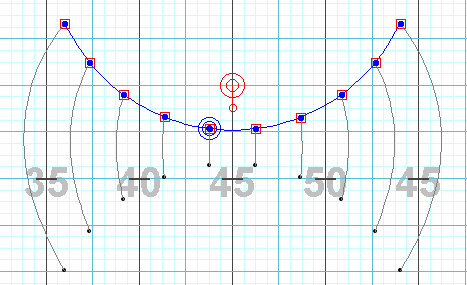 The Fixed Interval Float tool is an editing tool that allows transitions to incorporate curved paths. Since the Fixed Interval Float tool is an editing tool, performers must be selected in order to select the Fixed Interval Float tool on the Tool Palette. Once performers are selected, open the Fixed Interval Float tool. One performer will have a blue handle on top of them. This is the Guide Performer Handle. The performer with the Guide Performer Handle is the performer that all other performers reference to create curved pathways. Because of this, the performer indicated with the Guide Performer Handle will always take a straight line path to their destination. The Fixed Interval Float tool operates much like the Push tool. You can maneuver the form by adjusting any of the Edit Handles or by moving the Relocation Handle. Curved Shape option will create a curved shape between the handles. When the option is not selected, the shape consists of straight lines between the handles. To create a curved path with fixed (locked) intervals, check the Lock Intervals check box. This will make all performers take a curved path while maintaining their intervals in the form. Show Paths shows all of the paths of the selected performers you are editing. Dragging an Editing Handle (red box) reshapes the form. [SHIFT] click on the shape (blue line) adds an Editing Handle. Delete Half removes every other handle from the shape. Revert returns the form to its shape before floating. Reset to Hold resets the form to its shape at the Secondary count (yellow anchor) creating a “hold”. *The Fixed Interval Float tool is only available on the Interactive and Professional editions. See the Interactive Features page for more information on upgrading your 3D edition.